Last week we discussed monitoring a Windows machine with NCPA and Nagios XI to make sure that the server was functioning properly. In order to showcase the cross-platform capabilities of NCPA (Nagios Cross-Platform Agent) we decided it would be a good idea to show how to monitor a Linux machine as well. In this article I will show you how easy it is to monitor a Linux box using the same exact agent that we used to monitor the Windows box last week. Here’s how you do it. Category: Nagios XI and NCPA. Closed Tags: CentOS, linux, monitoring, nagios xi, NCPA, Wizard. 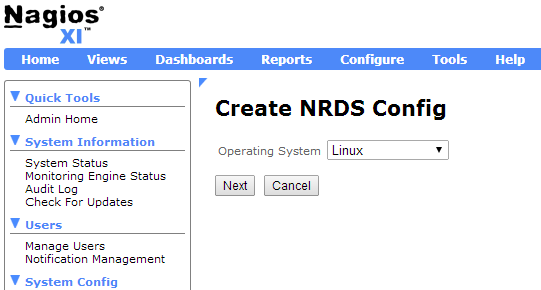 Step 1 – Installing and configuring NCPA on the remote box. The NCPA installer can be downloaded here: NCPA’s Installer Direct Download. Instructions on installing NCPA can be found here: NCPA Installations Instructions. Download it on the Windows machine that you want to monitor and run the installer. In this example, we will be using NCPA as an active agent. This is the quickest and easiest way to begin monitoring with NCPA. The image below is what the installation GUI looks like on the Windows device that you’re monitoring. To use NCPA as an active agent, all you have to do is enter a token. 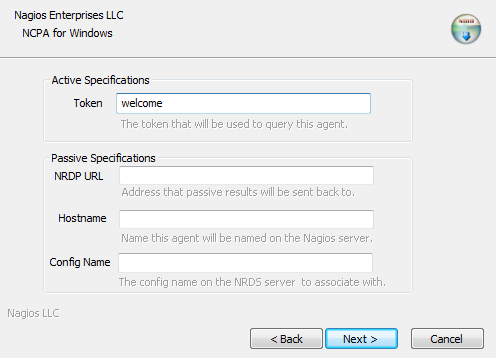 This token will be used to authenticate the connection between the Nagios XI server and the monitored device later in the article, so it’s important to choose a token you will remember. For this example, we entered “welcome“. Click Next to finish the installation. Category: Nagios XI, NCPA, Windows and Wizards. Closed Tags: active agent, agent, monitoring, nagios xi, NCPA, network monitoring, windows. The Mass Acknowledge component in Nagios XI 2014 makes it very easy to mass acknowledge problems with hosts/services that are in non-OK state. The component allows you to suppress additional alerts to be sent out, while a team member works on resolving the issue(s). This component can also be used to schedule downtime for hosts/services, or schedule immediate checks in bulk. From the Nagios XI Home page, navigate to Incident Management –> Mass Acknowledge. Select the function you would like to use from the Command Type drop-down menu. Then, select the hosts/services you wish to target. You can select some of the hosts/services by clicking on each checkbox or you can select all of them at once, by clicking on the Check All Items button. If you suspect that there are more hosts/services in a non-OK state than those you see on the page, you can always click on the Update List button on the top to update the list. Next, set the length of downtime in minutes, and enter a comment. You have an option to choose whether to send or not to send alerts. Simply select or deselect the appropriate Notify checkboxes. Also, you have an option to make some (or all) of your comments Sticky or Persistent. Note: If you want acknowledgement to disable notifications until the host/service recovers, check the Sticky acknowledgement checkbox. On the other hand, if you would like the host/service comment to remain once the acknowledgement is removed, check the Persistent acknowledgement checkbox. Finally, click on the Submit Commands button. Category: Alerts, Awesome, Components, Configuration, Cool Stuff, Nagios XI and Notifications. 1 Comment Tags: acknowledge, acknowledgement, bulk acknowledge, mass acknowledge, mass delete scheduled downtime, scheduled downtime.